When should your child start their college search? Many parents and school counselors think the college search begins in 12th grade, but earlier is better. It’s best to start thinking about the college search and application process as early as 9th or 10th grade, when you can still change your high school curriculum and impact your extra-curricular activities. Saving your college search until 12th grade is a mistake that many people make: In fact, the college search and application process is really a two-phase process. Many people jump in and start with Phase 2 without ever completing Phase 1! But by senior year, your child might be overwhelmed with academics by senior year, and college applications will add even more pressure. To save you and your child a stressful senior year, you need to start early. 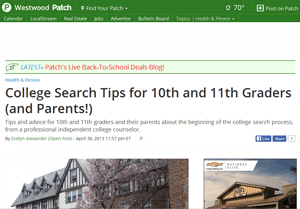 We shared our college search tips for 10th and 11th graders with the readers of the Westwood/Century City Patch to help all parents learn about the ideal time to get started.